When you’re older, mobility is no joke. You tend to encounter a limited range of motion, joints that don’t move as far as they used to, and pain when you try to push yourself beyond your limits. It hurts when you move, so you move less. Moving less results in more stiffness and even less range of motion. So, you move even less. And even if you try to break out of the cycle, all you get is articles online that show muscular young people doing the splits as they show you their mobility exercise routines and tips. Um, hello? That is not particularly helpful. 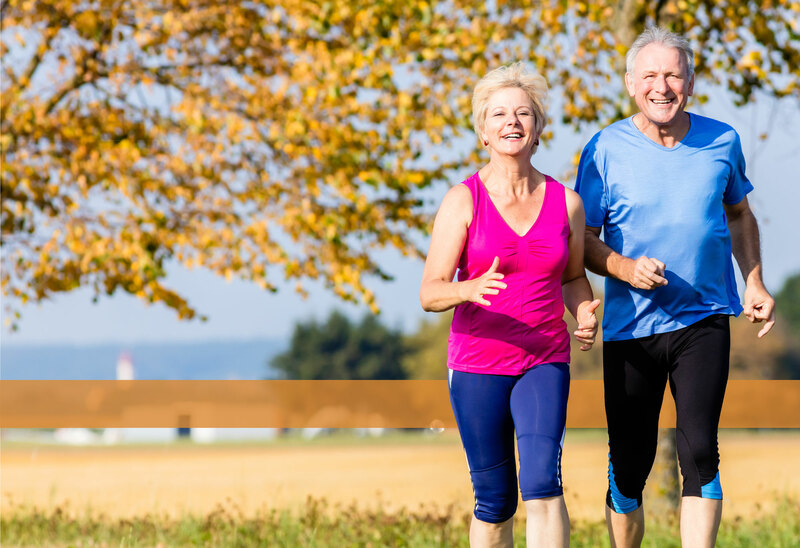 Here are some tips from our senior fitness program on how to help you to increase your mobility as an elderly person. 1. Start With Your Mindset. Almost any improvement in any area of life begins with your mindset. It’s a fight to maintain a positive, optimistic mindset, especially when you’re up against challenges that are greater than any that you’ve experienced in your life up to this point. Fight to be optimistic and say to yourself, “I can regain my mobility. I can improve my strength and balance. My body can recover some of the range of motion I’ve lost.” Just spending a few minutes a day visualizing your success can go a long way towards actually achieving the success you’ve visualized. 2. Activity Is the Key. If you’ve ever experienced physical therapy, you’ll know that therapists do everything possible to get you moving right away after an injury or a surgery. It seems counter-intuitive that you should start moving when you are still hurting. No one wants to hurt. We all want to avoid pain if possible. But there are certain kinds of activities where the physical benefits outweigh the pain that you experience to get there. In the long run, loss of mobility can bring greater suffering than the pain that it costs you to start to be active again. However, it’s also important to realize that there is a big difference between pain that indicates an injury and pain that means you’re actually helping your body. It’s not always easy to tell the difference. if you’re experiencing debilitating pain, nausea, faintness, or dizziness, you should stop exercising, consult with your doctor, and work with someone who can help to supervise your activity and ensure that you don’t injure yourself. 3. Mobility Starts In the Joints. When your mobility starts to be restricted as you age, your joints are the primary place that is affected. Joints tend to become stiff because your cartilage wears away, your joints are less lubricated, and buildup in your joints causes them to not want to move as much. A starting step that you can take is to think about each one of your joints and slowly stretch it as far as it will go. Repeat each stretch 5–10 times (or as much as you can handle). The first few times you do this, you will probably experience some aches the next day due to the unaccustomed activity, but you’ll be amazed at how if you keep it up, you’ll increase your range of motion and decrease the pain in your joints. Your mobility exercises shouldn’t include activity that creates a lot of impact on your joints. Gone are the days when you could just run downhill like you did when you were a child, but even milder activities can be too much. All that pounding can impact your ankles, knees, and spine in a negative way, but there are ways to increase your mobility without sacrificing your ability to move for the next week. The key is to be gentle. Gentle stretches, gentle movements, gentle exercises. Water aerobic activity is a common one that gives you a workout without overly impacting your sensitive joints. Don’t overdo it, and if you feel like you’re going to hurt yourself, stop. All you have to do is start where you are and do the amount of movement and stretching that you can do. Don’t go beyond what will disrupt your happiness and peace. Some people treat fitness like religion. You don’t have to do that. It’s not something you have to beat yourself up about. The beautiful thing that you’ll discover is that progress will just happen. As you consistently take small steps, those steps will accumulate into genuine results. This is why the LifeStyle Change at 75 program is designed to go at your own pace, only adding one thing at a time, and only doing that when you feel comfortable to do it. Persistence is more important than volume. 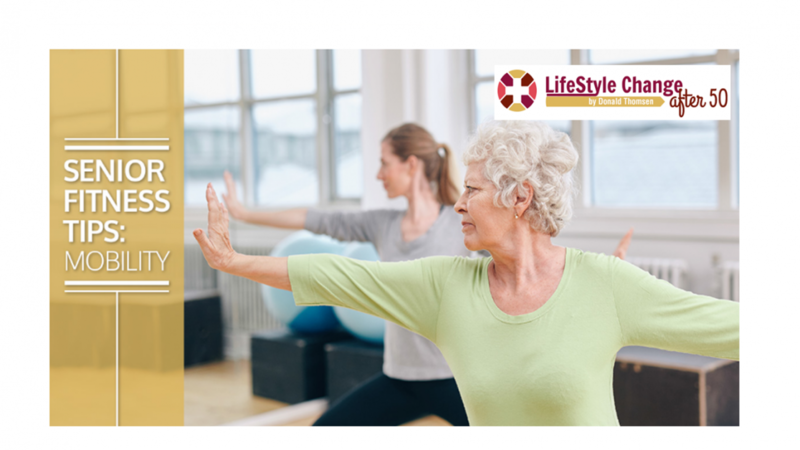 We don’t want you to hurt yourself, and if you have a health issue that would be exacerbated by even gentle stretching exercises, you shouldn’t do them. Let your doctor recommend to you the amount that you can do. If you get the green light, have at it! The easiest way to get stronger and regain your range of mobility is to have someone show you. When you sign up for the FREE video series by Donald Thomsen, you’ll get video lessons that will guide you through exercises that are easy, fun, and beneficial. All you need is an email address! The basic secret to living a healthy, more fit Lifestyle when you are over 50 is: “Everything in moderation.” That is the beauty of participating in my 3 Step Fitness/Wellness “90 day” Program. It’s easy, simple, and rewarding. In 90 days you will develop a modest daily routine that will sustain you for the balance of your life. By investing just a few minutes a day (not hours) you will sustain a vibrant lifestyle that will afford you the luxury to achieve your hopes and dreams for the future. “IF YOU HAVE A GOOD ATTITUDE, LOOK AND FEEL GOOD . . . ANYTHING IS POSSIBLE! Check out my offers below: Sign Up for my FREE 3 Step Video Series and Newsletter then JOIN US in our 12 week Fitness/Wellness Program. Become A FULL Member Of Our 12-Week Program! © 2018 Lifestyle Change after 50 by Donald Thomsen. Do Not Copy.